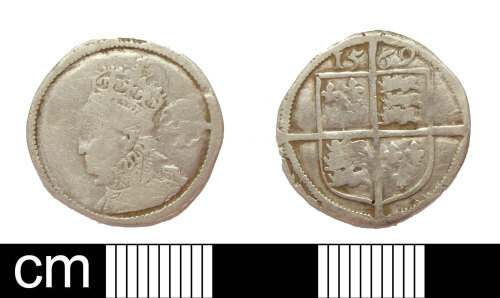 A clipped silver sixpence of Elizabeth I (1558-1603), dating to 1569. A worn example with the legend removed by clipping. Initial mark missing but would have been coronet. North (2006:135) no 1997. Minted at London. It is 18.8mm in diameter, 0.66mm thick and weighs 1.57g. Reverse description: Square shield with date above, on long cross fourchee dividing the legend. A silver sixpence of Elizabeth I (1558-1603). Initial mark: coronet, dated 1569 (North 1997). A complete silver sixpence of Elizabeth I (1558-1603), dated 1569. Initial mark: coronet (North1991: 134, ref: 1997).